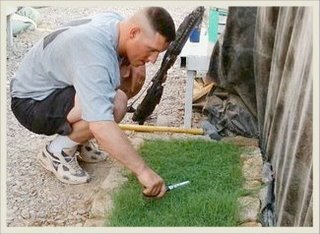 CAPTION: "Photo Courtesy of U.S. Army"
A soldier who was stationed in Iraq asked his wife to mail him some dirt, fertilizer and grass seeds so that he could grow some grass to remind him of home. As you can see in the photo, he is even mowing his newly planted lawn with a pair of scissors! Sometimes with all the busyness in our lives we forget to give thanks for all the things around us that are blessings. Often we just don't appreciate all we have and complain about all the things we don't have. Hopefully this photo encourages us to stop and think about the little things we take for granted. Feel free to send this to somebody and share this photo. Just click on the little envelope below or here. Hi I found you on Link Referral. I love this story, so uplifing to read about the soldier who wanted a little bit of home in Iraq. This is a really touching story. I will most definitely be forwarding this image along. It helps us to remember the importance of the small things we have come to take for granted!